Apologies for the delay in posting, I'm settling into my new job at the moment and life has been very busy! But I thought I'd jump right in to talk about one of my newest 'can't live without products'. 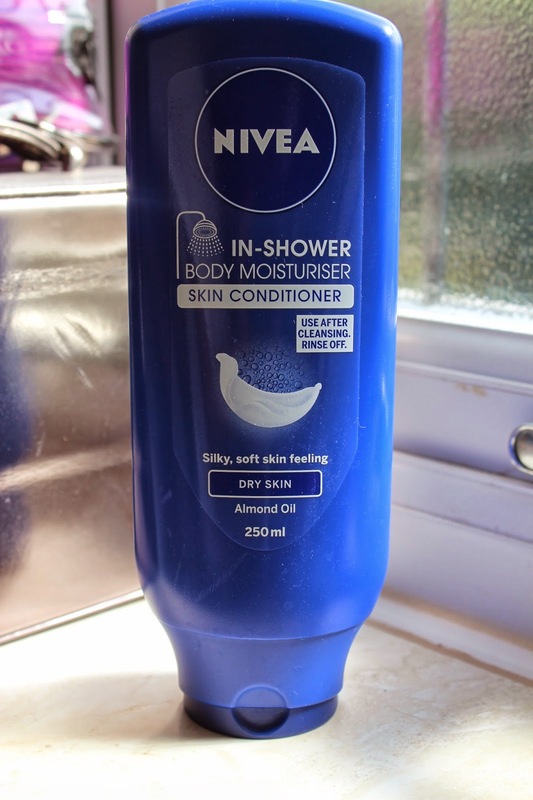 There are two versions of the Nivea In-Shower Body Moisturiser, I opted for the one for dry skin. I don't have particularly dry skin, however I am a moisturiser obsessive so knew that this would be the best option for me. I am a big fan of using baby oil in the shower after washing, it cuts soo much time moisturising out of the shower and is far more convenient for times when you need to be dressed and out the door in good time. This certainly isn't the most luxurious product in terms of moisturisation (it's no Laura Mercier body soufflé! ), but it doesn't claim to be and my skin does remain soft all day - not to mention it smells gorgeous! It has the 'original' nivea scent, which I have always been a great fan of. It retails for £3.56 (£5.10 for the 400ml), which I think is quite reasonable really, especially when Boots/Superdrug often have offers on. I can't get enough of it; I will actually be popping out today to get another one!